After meeting Hawley Bennett-Awad on the side of the road while out hacking, Jennie Duke signed her daughter, Elise, up for lessons. 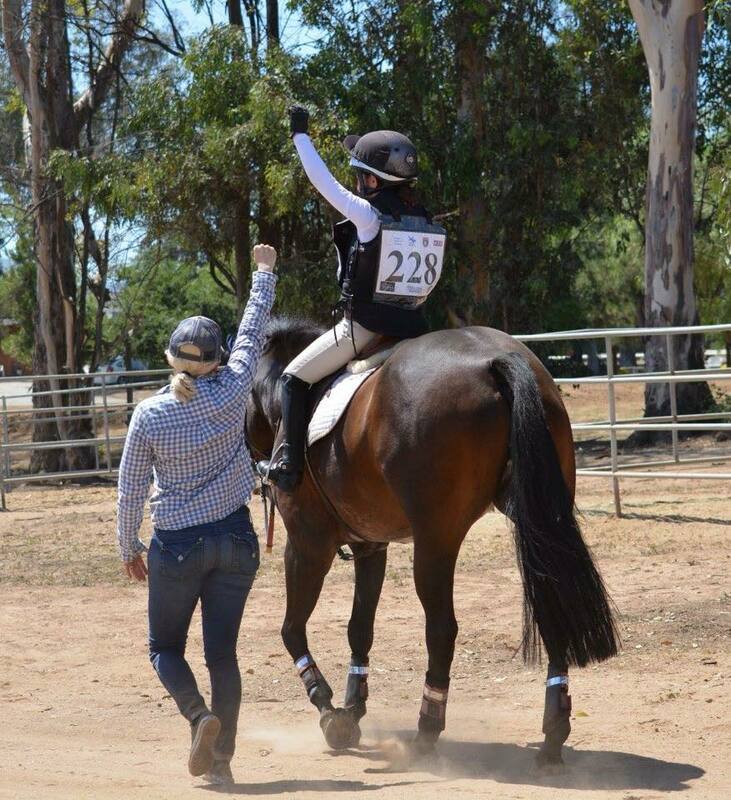 Now, two years later, Elise has blossomed into a dedicated equestrian and Jennie was gracious enough to take us along for the ride at her very first horse trial. Many thanks to Jennie for writing, and thank you for reading! Fist pump! Hawley Bennett and Elise Duke celebrate a great round. Photo by Jennie Duke. Slightly out of breath, I quickly swung the door open and found a stunned FedEx driver with a dropped jaw and raised eyebrow. I immediately composed myself, cleared my throat, and explained that I wasn’t aware I had to sign for the package. Without saying another word, the exchange was made. I politely thanked him and gently closed the door. Then, like a child on Christmas morning, I swiftly ripped open the package and started browsing through my most precious memories. I instantly noticed that almost every page was filled with pictures of horses. The book chronicles my daughter’s journey with Hawley Bennett. I began with the pictures of Elise and Hank. 45 minutes and 254 pages later, Elise was in her first horse trials. With tears in my eyes, I closed the book. I was at a loss for words. 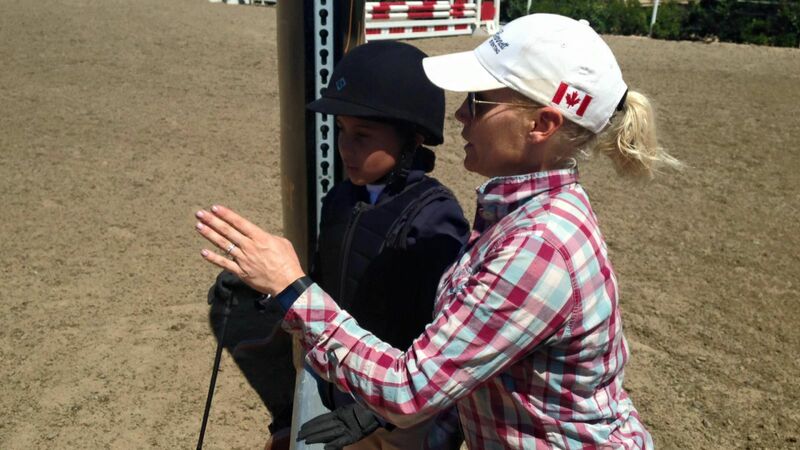 Hawley took my 7-year-old, pony-obsessed daughter and transformed her into a focused and dedicated 9-year-old equestrian. Elise spends most of her free time at the stables. She goes to school then comes straight to the barn for a lesson. She spends the weekends there as well. In the summer, I drop her off in the morning and she spends all day there. She helps with the daily chores and gets to ride three horses, including the legendary Hank. She comes home exhausted! Starting in sixth grade, she wants to be homeschooled so she can spend more time with the horses. Hawley is quickly becoming her second mom, and the barn is her second home. 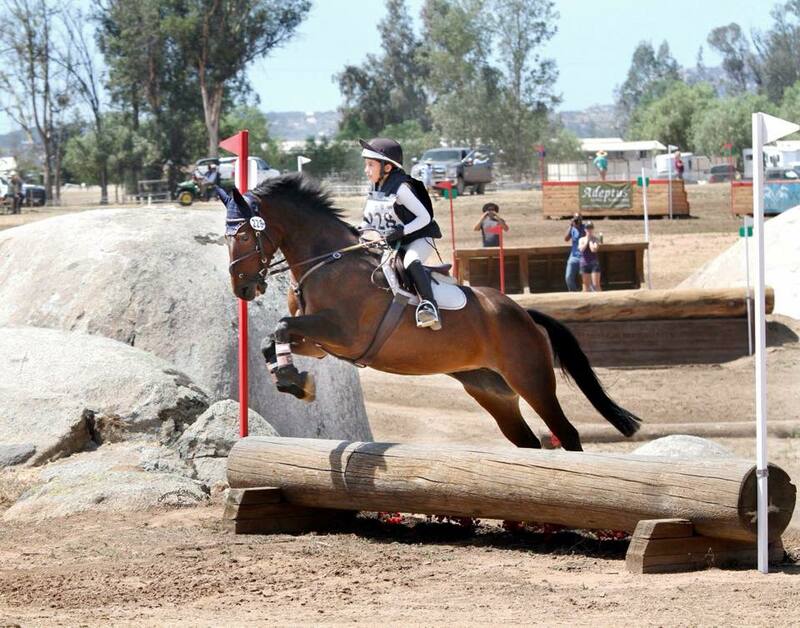 Over the summer, Hawley told us that Elise was ready to compete in her first horse trials. Elise was thrilled and she started training even harder. I didn’t know how Elise was going to perform and I didn’t know how she was going to handle her nerves. I was pleasantly surprised. Walking show jumping. Photo by Jennie Duke. As soon as Cookie was taken care of, she would sit next to our trailer, play some music, and focus on the task at hand. Before her dressage test, she made a makeshift dressage ring in front of our trailer. She walked the test numerous times until it was finally time to get ready. She was nervous, but she used that energy to step up her game. Her posture was beautiful and my little girl looked mature beyond her years. Her hard work paid off and she ended the day in 4th place! After she competed, she turned back into the 9 year old girl that I know. She helped the girls with the horses while snacking on as many chocolate chip cookies as she could sneak by me. She was more relaxed on Saturday and Sunday. She found a friend to play with, and they palled around together the whole time. Everything excited her. She was so focused when she was walking in the show jumping arena. She and Hawley were all business. Once again, her hard work paid off and she had a double clear round. However, what really made Elise fall in love with the sport is cross country. On Saturday evening, she walked the course several times. I could see the excitement in her face. She couldn’t wait to get on Cookie and charge through the course. Elise was handling the competition like a pro. Sunday morning was no different. She was focused and driven. She was having the time of her life. For me, on the other hand, I was starting to stress. I could feel my stomach tighten. Luckily, Copper Meadows comes equipped with the proper first aid for worried mothers. It’s called the margarita truck. Yes, I had to drink before my precious daughter went on course, but it worked! I was still nervous, but the knots in my stomach went away. Elise and Cookie looked beautiful as they were flying over logs and cantering through the field. Elise and Cookie out on course. Photo courtesy of Captured Moment Photography. It became very clear to me that Elise was born to do this and I feel so blessed that Hawley is there to guide her. I couldn’t ask for a better role model. Elise finished the event in 3rd place. She almost cried when she found out because she thought she came in too soon for cross country. Ever since the show, Elise developed a burning passion for the sport. She’s determined to compete at the novice level at Rebecca Farm by next year. Last week, I doubted her. After this week’s jumping lesson, I know I’ll be packing my bags for Montana. I’m not going to push her, but I’m not going to tell her no. It will always be up to Hawley and Elise to determine where her next adventure will be. Montana seems like a stretch, but if she puts her mind to it, I know she’ll succeed. Montana is her fear, but she isn’t afraid of it. Her challenge excites her and I’ve never seen her ride with such determination. It’s as if the horse trials at Copper woke up a sleeping giant and that giant is ready to run. I’m just going to sit back, take some deep breaths, drink a glass of wine, and enjoy the ride.